Reality TV is all the rage these days but I rarely watch this genre outside of a few cooking competition shows like Top Chef or Masterchef. But I have been hooked this year by ABC’s ‘Shark Tank’. The show’s premise is simple; entrepreneurs pitch their products to a panel of well known investors (‘sharks’) such as Mark Cuban, Kevin O’Leary, Daymond John, and Lori Greiner. Sometimes the entrepreneurs fall flat, other times they walk away after some interest, but most times they arrive at some sort of deal trading investment for equity in their company. Wine products have surprisingly been featured a couple times this season but the most interesting was an invention called ‘Wine Balloon’ (later changed to ‘Air Cork‘) that preserves wine with a patented balloon system. Inventor Eric Corti was clearly nervous pitching the panel of sharks but did well enough to garner two offers from Kevin O’Leary and the combined team of Mark Cuban and QVC host Lori Greiner. It was clear that Corti didn’t like the strings attached to O’Leary’s offer to license the invention to a third party for marketing but was surprised when Greiner offered $500,000 for the entire company. Cuban joined the offer which grew to $600,000 but demanded an immediate response. Corti didn’t act fast enough but accepted their final offer of $400,000 for his invention. At the time of the show I thought Corti made the wrong choice as $200,000 of value had been taken off the table in under 2 minutes. 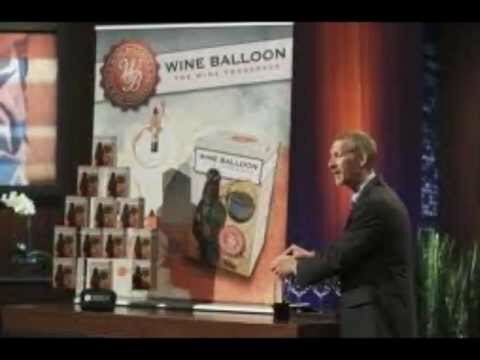 And Wine Balloon seemed like a novel idea that might see wide distribution in winery tasting rooms and wine stores (although the reviews on Amazon currently are not encouraging). So it was good to see an update to this story last week at Wines & Vines. After due diligence, Corti and his partner walked away from the deal and worked on building their business. And it appears to have worked with sales reported at 15,000 units a month. Using the cost of goods disclosed during the show of $6.50 that makes over $260,000 of gross profit a month or $3.1 million annually. It’s good to see an entrepreneur stand his ground and make something work as it was clear during the show that Corti really believed in his invention. If you want to see the episode of Shark Tank it is available to Hulu Plus subscribers here (season 3, episode 4). Corti’s pitch starts the second dot from the end on the timeline. Thanks for the update on our product. We do appreciate all feedback on our product – and please note that I have commented / responded to each of the 3 folks who purchased from a seller on Amazon and asked them to contact me directly where we will absolutely warrant the product. The Air Cork works…..and is the only wine preservation devise you can see and know is working. We completely stand by our product. Thanks for stopping by Eric. I’ll be ordering an Air Cork for testing and a follow-up post. I’ll be watching for that review! I have thought to buy this. I am a sucker for this TV show and seeing the products come out on Amazon that I watched on the show are always fun.